Hunga Tonga-Hunga Ha’apai wasn’t supposed to last. The cloud of volcanic ash that became island-shaped in early 2015, about a month after an underwater volcano erupted in the South Pacific Kingdom of Tonga, was expected to be washed away by the ocean in three to four months. Instead, it’s persisted for years, all the while shapeshifting before our eyes. And according to new research led by NASA, it could last for decades more. “We haven’t had an island like this sustain itself in 50 years,” Jim Garvin, chief scientist of NASA’s Goddard Space Flight Center in Greenbelt, Maryland, told reporters at a press conference at the American Geophysical Union meeting in New Orleans yesterday. As Garvin explained, the shallow submarine eruption that birthed Hunga Tonga-Hunga Ha’apai was special. Not only did the eruption spew lava, “it also produced some of the explosive magma water interactions that were the hallmark of the eruption that produced Surtsey,” an island off the coast of Iceland that formed in the 1960s and has persisted to this day. Garvin believes Hunga Tonga-Hunga Ha’apai has outlived its expected lifespan because of chemical interactions between warm seawater and volcanic material, which caused its rocky shorelines to harden shortly after the eruption. 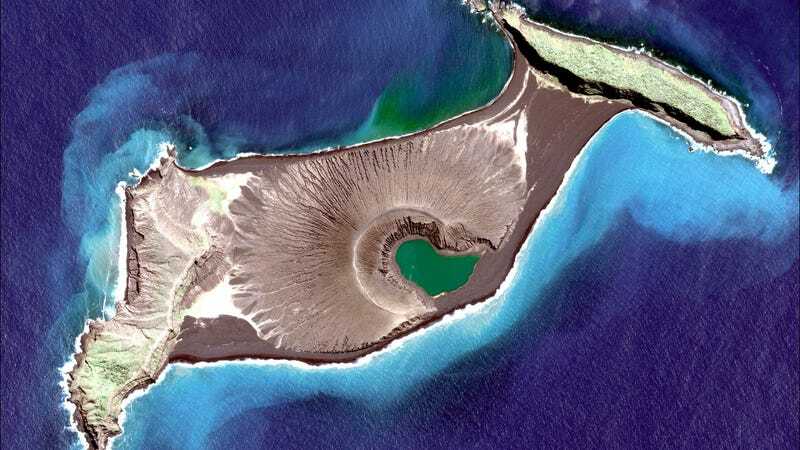 If this hunch is correct, it would make the new island the first long-lived “surtseyan” island of the satellite record. 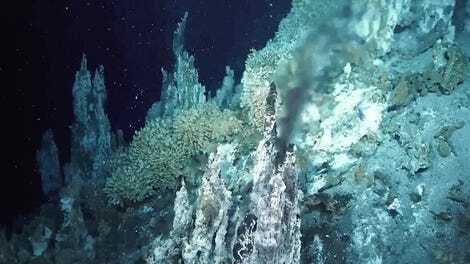 Scientists are now monitoring the volcanic island closely, using monthly satellite images to track its changing coastlines, and nearshore measurements with research vessels to map the seafloor. They’ve watched it change dramatically. Initially, Hunga Tonga-Hunga Ha’apai was fairly oval-shaped, rising 400 feet from its coastlines to a central tuff cone. Over time, the entire island has become thinner and more stretched out as material erodes off the tuff cone and collects along the coastlines. The first big change came in April 2015, when satellite images revealed that the cliffs marking the southern rim of the crater had collapsed. A few weeks later, the last remnants of the crater wall were gone, opening a central lake to the ocean. At that time, Garvin explained, there was a risk of ocean waves impacting the tall cliffs on the inside of the crater, accelerating the cone’s collapse. But within a few more weeks, a sandbar had formed to protect the crater lake. That feature has persisted until this day. The other major change has been the growth of a large peninsula to the northeast. By April 2015, that peninsula connected Hunga Tonga-Hunga Ha’apai to another nearby island. It has continued to widen over time. To their surprise, the researchers are finding that the total volume of the island, as estimated using elevation models, has remained fairly stable after the first few months. Hunga Tonga-Hunga Ha’apai is now expected to survive for anywhere from six years to about three decades, depending on how quickly the tuff cone at its center is destabilized. The question now is, are the different stages of the Earthly island’s evolution evident in volcanic features on Mars? And if so, does that tell us something about when Mars last had water, and how deep and widespread that water was? “We think [this is] a real opportunity for learning,” Garvin said. This has been your periodic reminder that Earth is a dynamic, amazing world, and we’re damn lucky to live on it.